Mnium marginatum forms shoots 1.5 to several centimetres tall, growing in tufts that are often tinged red in the lower part. 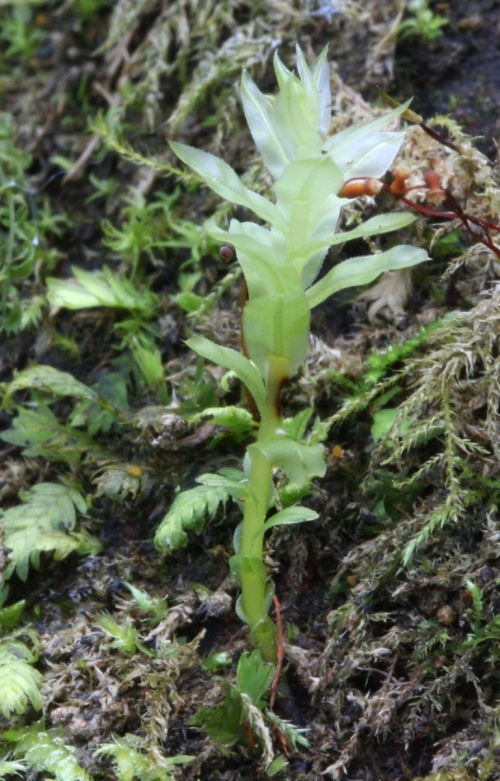 The egg-shaped leaves are 4 to 8 mm long, and at the base run distinctly and broadly down onto the stem. Long, narrow, toothed cells make up the border. In upper leaves, the nerve often reaches the leaf tip. The lower part of the stem bears smaller (3 to 4 mm long), but quite broad, scale-like leaves. Capsules frequently form in early summer; they are 3 to 5 mm long, with a beaked lid. Favours damp, sheltered, lightly shaded, base-rich soil and shallow soil on rocky ledges and in crevices, for example on river banks and shady walls. It has a mainly lowland in distribution. Widespread but with a more northerly and westerly distribution in Britan.